The Stella Maris Explorer is a 36 meters liveaboard operating in the Philippines. 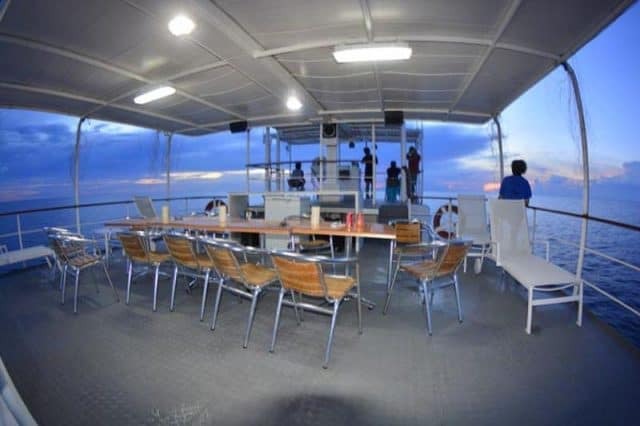 The motor yacht is described as a “pleasure boat” and offers scuba diving cruise on the Tubbataha and Apo-Coron reefs. Built in 1986, the dive vessel has been upgraded any times ever since and upholds great navigation & diving standards. The Stella Maris provides enough cabins to welcome 20 divers on every voyage. 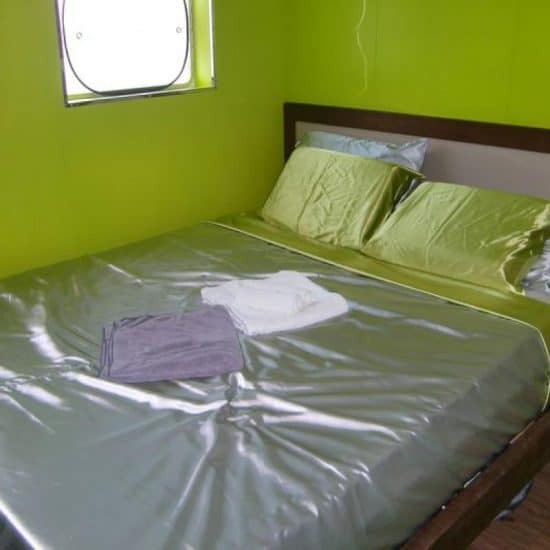 Indeed, there are 10 air-conditioned cabins on the boat and each is completed by a full en-suite bathroom. Also, cabins have hot water running in the shower and new memory foam mattresses. Plus, every cabin displays enough storage and wardrobe space for your belongings. 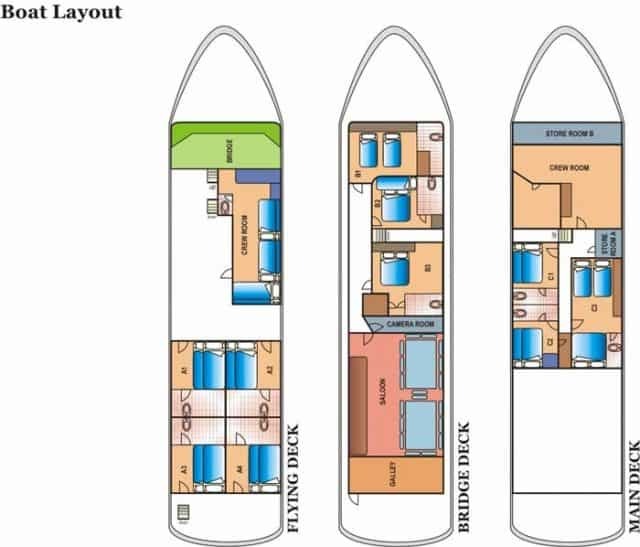 Moreover, cabins are divided onto 3 decks and some feature twin-beds and other have double/queen beds. 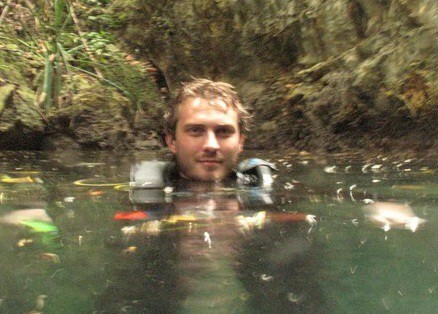 Visit this page to compare liveaboard & prices for the Philippines! First, the Stella Maris is fully air-conditioned inside and is fitted with modern furniture and a carpeted flooring. Additionally, the indoor lounge, or salon, is fitted with cozy couches and feature a complete TV/DVD entertainment system. Of course, you will find an extensive DVD, books and games library on-board. Furthermore, the partly shaded top sundeck features ample space for loungers but also a table and a bar area. You will surely agree that it’s the best place to enjoy the ever changing view of the Philippines. You can watch the sun go down and the stars shine at night, while you enjoy a drink! The second favorite spot is definitely at the bow as that’s where the jacuzzi tub can be found! The Stella Maris Explorer is part of the Expedition Fleet Liveaboards which also include the Borneo Explorer, Eco, Crystal and Oceanic Explorer. This dive vessel is considered as one of the pleasure yacht of the fleet as it boasts plenty of cozy outdoor space. The Stella Maris is equipped with all the latest scuba diving and navigation technologies. Indeed, the radios, telephone service, GPS, depth eco sounder, first aid necessities and much more are kept up to date. Diving wise, the vessel is equipped with compressors and full sets of scuba gear to be rented on demand. Plus, NITROX is available and there are 2 tenders to assist the mother ship in the diving operation. Finally, the highly skilled and experienced crew is helping divers all along the trip to ensure the best and safest experience! Please see the Expedition Fleet site to have information on prices and schedules! 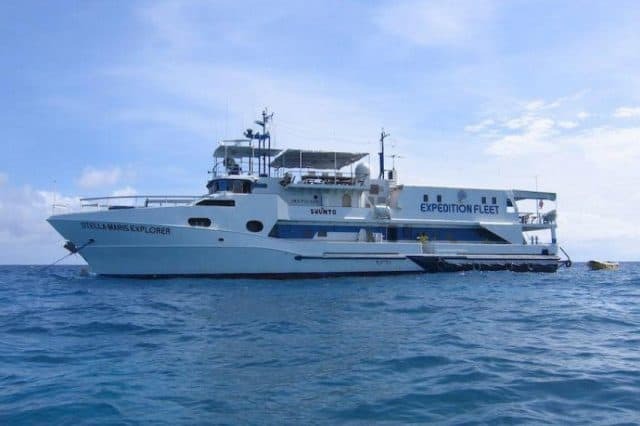 If you have been diving on board this liveaboard dive boat in Coron, Palawan & Philippines, please share your review and let us know what you thought. Please post your comments in the review section below, by doing so you will help fellow divers to plan their next diving trip . I have been on the Stella Maris and also on the Borneo Explorer with the same fleet. Honestly they both are great. The Stella is an older vessel but it’s really well maintained on-board. The main suggestion/comment I made at the end of the trip is that I wish seatings options were more cushioned… if I can say that. Otherwise the beds are super cozy so that was great and the food was yummy during the whole trip! Otherwise, the Tubbataha reef diving was magical, just like it’s expected. Thanks for reading! The Stella Maris Explorer surely has the experience to get the best out of diving the Tubbataha and Apo-Coron reefs!